Used to be that we knew who The Enemy was (the Commies) and what to do about it (build a cinder block bunker in your backyard with the help of the government brochure). Nowadays, tho, there is no single threat but a myriad of threats: terrorist attacks, super volcanos, pandemics, total economic collapse (or at least hyper inflation), solar storms, CME's and just plain old hurricanes, flooding and tornados knocking power out for who knows how long. 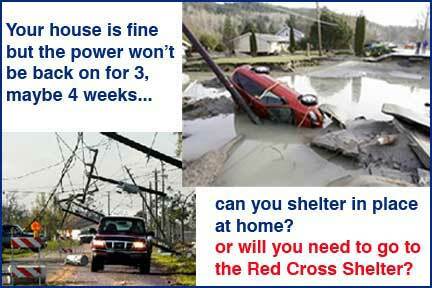 Look at Hurricane Sandy - there were people without electricity for well over a month and that was "just a bad storm". If your power and water were turned off for a month, and for a month you could buy no gasoline, nor go to any store, HOW WOULD YOU FARE? What would you eat? What would you drink? How would you make that cup of coffee in the morning? And cook? How would you see once the sun went down? Bathe? What's that? You want to be able to say Hey! No problemo here! and that is what I'm here to talk about, to share knowledge about, because it IS doable guys (and female guys - we should be friends if we're gonna talk life and death and living thru god knows what). I started storing food (in a serious way) in 1989. We were told we would be wise to "Store food" and that we should target 2 years worth. Of course it made sense to store food. Now, I have never been one of those people that gingerly dip their toe in the water to see if it's cold or not. Me, I jump in with both feet. And because there was a group of us taking on this task, I got to get a really diverse assortment of grains, beans, peas, pasta, nuts, fruits, seeds, spices and some things that were not really meant for long term storage. Others were probably doing the same thing. Here we are approaching December 21, 2012. That's an even BIGGER bugaboo date than 12/31/1999. I wondered (well, I had been wondering for a few years) how in the heck that food was that I put into buckets in 1989. No sense in continuing to store stuff that was no good. But you don't want to throw something away that IS good (especially if you have MY packrat genes from good ol' Grandma Simpson who lived through the Depression). So I started going through the buckets. 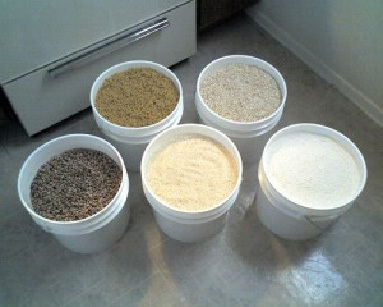 Mind you, the buckets had all been stored in pretty good conditions: you store buckets in a basement were it doesn't get blistering hot in the summer or freezing cold in the winter and that increases the shelf life of your food. And the heat is a bigger enemy of stored food than cold is when you are looking at dried foods like grains, beans, fruits and veggies. Well, the wheat all looked perfect. Bucket after bucket of wheat that I didn't really have much intention of turning into flour to bake bread with (OK, there are probably some of you that bake your own bread on a regular basis, but I bet the percentage of readers who do is fairly low). But I figured I can grow wheat grass and juice it and since it is a magic elixir having that wheat that was still good is a dandy thing. So I quit looking in the wheat buckets. What I did instead was take a bucket of wheat and rock it back and forth. If the wheat "sloshed" back and forth freely I marked the bucket good and dated it. If it 'sloshed', that is, moved freely like fresh grain kernels should, then did it look OK? Smell OK? 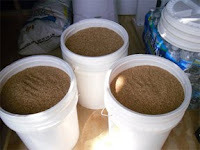 Then chances were extremely good that it WAS OK. Any bucket where I could take off the lid and rock the bucket back and forth a bit and nothing moved, I blessed, banged the lid back on and labeled it Hog Food (no sense in wasting food – I know a person who raises hogs and it is fine for them). So far I had only looked at whole grains. Then I came across some rolled grains, like oatmeal and 7-grain rolled cereal. 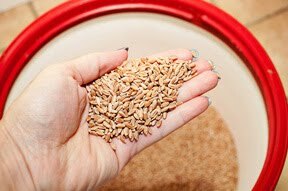 It is said that rolled oats and other rolled cereal is only good for about a year or so. Well, the rolled oats 'sloshed', looked OK, tasted OK so I called 'em good and marked the bucket. 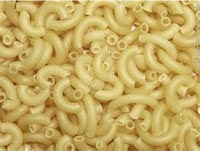 The same with a bucket of the 7-grain rolled cereal – it looked fine, tasted fine so fine it was. And then I opened the other bucket of the identical rolled cereal put up at the same time. YIKES! BUGS! BIG BUGS! ( I, of course, screamed like a girl which I rarely do.) I didn't take time to investigate. I just bashed the lid back on the bucket and labeled it Hog Food (hogs don't mind bugs). And then there were the pastas. The regular spaghetti looked as good as the day it was stored. The whole wheat spaghetti also looked just fine. The elbow macaroni: 100% corn elbows, whole wheat elbows, regular elbow macaroni – all looked as good as the day it was stored. Elbow macaroni seems like it will stay fine until kingdom come. The only pasta that looked a little iffy, not bad, just not quite as 'right' as it was when stored, was the spiral pasta. The plain regular kind looked OK. The three color spirals looked iffy enough that I labeled them 'barter or hogs'. I'm sure they weren't 'bad' where they'd make someone sick. They were edi ble food that could save a life, but I already had plenty of elbow macaroni so it was ear-marked for someone else. I also went thru some buckets of fruit. Now mind you, back in 1989 there was no such thing as Mylar bags or oxygen absorbers. We'd throw a handful of bay leaves into the bucket of wheat, bash the lid on, label the bucket, bless it and call it good. So I was mighty curious about the dehydrated fruits. I had stored some raisins in jars in my spare room. Yes, it got hot in there in the summer but usually not terrible since we are up in the Northwest. And it got cold in the winter (not a problem, heat's the problem). 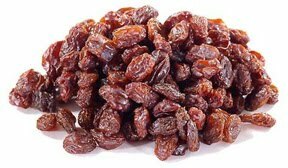 Well after 5 or 6 years those raisins went right past being "sugared" to being down right gnarly. Nasty looking. I wouldn't try one. What did I find when I opened the buckets where I had put raisins, figs, candied ginger, apple slices and peach slices into Freezer Ziploc baggies and then put those into buckets, blessed 'em and called 'em good? Well, I was surprised, I'll tell you that. The raisins? They looked FINE. No kidding. I was amazed. I opened the Ziploc bag and tried a couple. They TASTED fine. Wow. 23 year old raisins ready to go into a bowl of oatmeal or into some cookies (or just snacked on). The figs had sugared just a bit. (Sugaring is where the natural sugars in the fruit crystallize on the outside of the fruit.) So I tried a fig. A teeny bit more dehydrated than in 1989 but barely so. They were fine too. Holy cow! 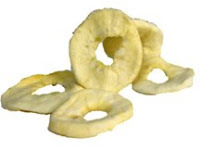 The apple rings LOOKED fine but had zero taste left at all. Probably would save someone's life but there was no 'apple-ness' left in them so I marked them food for the hogs. The peaches were pretty much in the same boat. But the candied ginger? It was exactly as it was when I put it up in 1989, which was GREAT. Anything that didn't freely move in the bucket had become kind of welded together. That's usually a sign that moisture has caused the grain, beans, flour, corn meal, whatever to kind of bind together into a block. Would it maybe save your life if you had to eat it? Maybe. Would it maybe make you sick? Maybe. My rule of thumb is "When in DOUBT, throw it OUT." Better you should make room for something else that you know is good.